“From East to East (and Back East Again)” | Jordan Ink. BRATISLAVA — I’m out working late tonight, still trying to clear a backlog of assignments. But I can’t resist sharing with you the cast of characters I just passed in my 10-minute walk to a downtown cafe. Why? Because for the Slovakia-curious – I know you’re out there, admit it – it’s a quick snapshot of Bratislava’s reality. The Good. The Bad. The Pitiful. I haven’t yet seen any touristy, “Bratislava Is For Lovers!” t-shirts. More popular is any reference to Slovak beer. Or its consumption. However, the public mating ritual is certainly a constant around here. And a nice antidote to the politics that tries to poison relations between majority Slovaks and minority Hungarians. Next, I see a young boy of 4 or 5, gliding on a pedal-less wooden bike beside a middle-aged man, who could be his father or grandfather. Slovaks seem to enjoy their children, especially heading into the great outdoors en famille. Moreover, Bratislava is not only the capital, but the hub of economic, intellectual and cultural life. You see several generations of the same family here, as in, original Pressburg families. Then there are all the folks from the countryside who came here for university, pursue a career, or simply hunt down any sort of available job. Eventually, some bring their parents here as well. BRATISLAVA — At last, Bulgaria seems to be doing something about its notorious corruption problem, a necessary step to appease the European Union and keep billions of aid flowing into the Balkan country. On Thursday, Bulgaria – the EU’s poorest and most corrupt member – scored its first high-profile conviction of a government official, an ex-agriculture honcho sentenced to four years in prison for allegedly stealing millions of EU funds. I’m sure ordinary Bulgarians are delighted. Many have told me how angry and embarrassed they are about Bulgaria’s image, and how they despair that anything will ever change. In late 2008, I explored Bulgaria’s endemic graft in a series of articles for the Christian Science Monitor, highlighting how particularly widespread it is in agriculture and road construction. What made this situation unique was Bulgaria had already been admitted to the EU in early 2007, raising the question: Once a country is in the club, how to react when a new member behaves badly? Worried about how aspiring members might view inaction, Brussels made an example out of Sofia, smacking it with an unprecedented punishment: $315 million in aid was withdrawn. Bulgaria’s attitude shifted with last July’s election of Prime Minister Boyko Borisov, a former bodyguard and karate coach who vowed to get tough on corruption. Brussels has wanted Bulgarian authorities to send a message throughout society that lawlessness won’t be tolerated, and will continue to push for more “results,” one analyst in the capital tells me. BRATISLAVA – Patches of sunshine teased us today, but you couldn’t ignore the bone-chilling cold. Still, Kapitulská Ulica beckoned me for a brisk walk. From the 16th to 19th century, “Canonry Street” greeted the first steps of the newly coronated Hapsburg kings and queens, who descended from the St. Martin’s Cathedral, whose exterior is now partly blackened by soot. Today, you can hardly imagine such pomp. 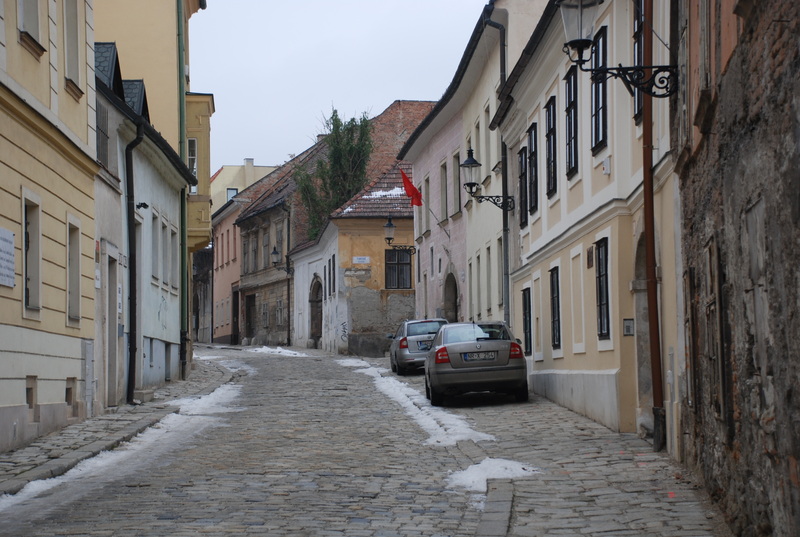 While Kapitulská is the most authentic section of Old Town Bratislava, it’s also the most neglected. Both reasons make it my favorite spot in Bratislava, a fragment of the past where I blur my eyes to visualize life in “Mitteleuropa” centuries ago. But today’s sunlight, so deceptive, put me in a Kapitulská state of mind. I set out on the winding, cobblestoned lane — as always, on guard not to sprain an ankle on the steep stones — admiring the simple but elegant two-story homes, with archways tall enough for the horse-drawn carriages. Today, though, I was reminded of the striking difference between Kapitulská and the hub of the Staré Mesto, or “Old Town,” just a couple blocks away. While that quaint, period-piece restoration (and multitude of cafes) draw stylish Slovaks and a stream of tourists, Kapitulská looks untouched. He had planted himself smack in the middle of the stone-paved Old Town, his feet pointed inward, like an extreme case of pidgeon-toed-ness. He was begging from passers-by, who averted his eyes and refused to break stride, the prejudice against “Gypsies” too deeply ingrained. It occurred to me: Why do I feel sympathetic to a bedraggled Caucasian in the streets, but not this guy? Because I’m not immune to the nasty stereotype of the Roma as beggars? Or that it’s all some kind of “scam”? It was a cool moment, on a cold but sunny day. I don’t quite know what it meant to him. (Let’s assume it was meangingful, OK?) For me, though, I realize that after a year of training young Romani journalists in how to explore interesting Roma topics, I’ve become a Roma-phile. I can’t help but humanize them whenever I can. If this fellow wants to earn a living this way, why not help out now and then. BRATISLAVA – Here in one of Europe’s least-known capitals, I don’t come across many groups of young foreigners who actually live in Bratislava. Not like in magnetic Prague. If my ear serves me right, I’ve identified packs of university students here from places like Spain, Greece, Israel and the Middle East. Since I don’t speak their language, I can sit in a cafe and enjoy people-watching from a distance without actually understanding what silliness they’re roaring about. I can also concentrate and get work done. A pleasant combination. Tonight, though, I’m in a smoky cafe, and the only available table is cozily next to a trio of Westerners. Speaking English. Loudly. The two guys seem to be Brits, the woman a Scandinavian of some stripe. They seem well-meaning, curious enough to want to explore Europe. They also sound too seasoned and familiar with each other to be back-packers … Wait, there’s talk of summer break. University students. Studying theater. Their coarse language, though, is becoming noise pollution. I can barely block it out. The only reason I’m out working late is to push forward an article I’m writing about the Kosovo Roma refugees withering away in Macedonia. One of the fellows is on my nerves with graphic detail about his jiu-jitsu trainings. How graphic? Well, I’m hearing way more than I need to hear about what exactly it feels like to be kicked in the head, or taken down hard. If I were out for a beer or two, maybe I’d ask a few questions. Like, why the hell anyone would want to do that to their brain. But tonight I’m into a pot of jasmine tea – and this close to relocating my laptop.